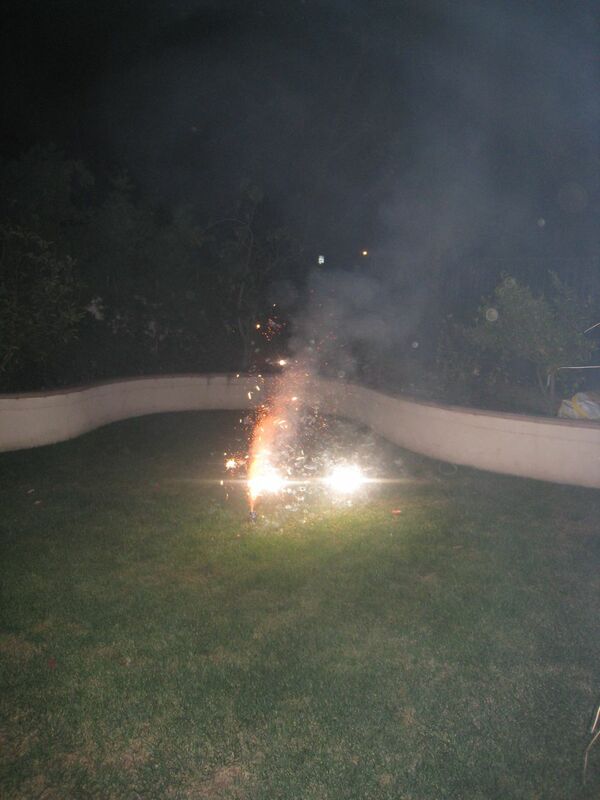 We had a Diwali get together with Arun, Jo and their girls this week along with all of the requisite fireworks. 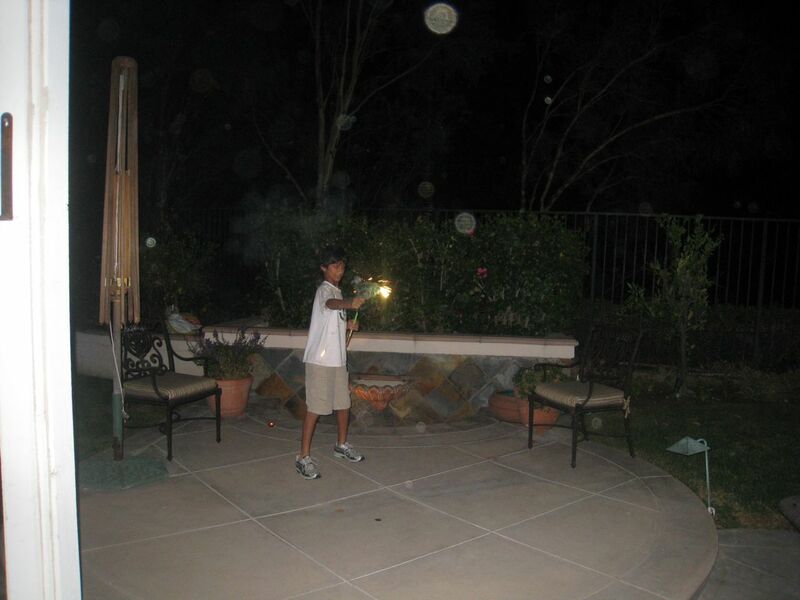 It got quite smoky and loud with the firecrackers, smoke bomb and whistling fireworks. We went to Disneyland on Saturday. 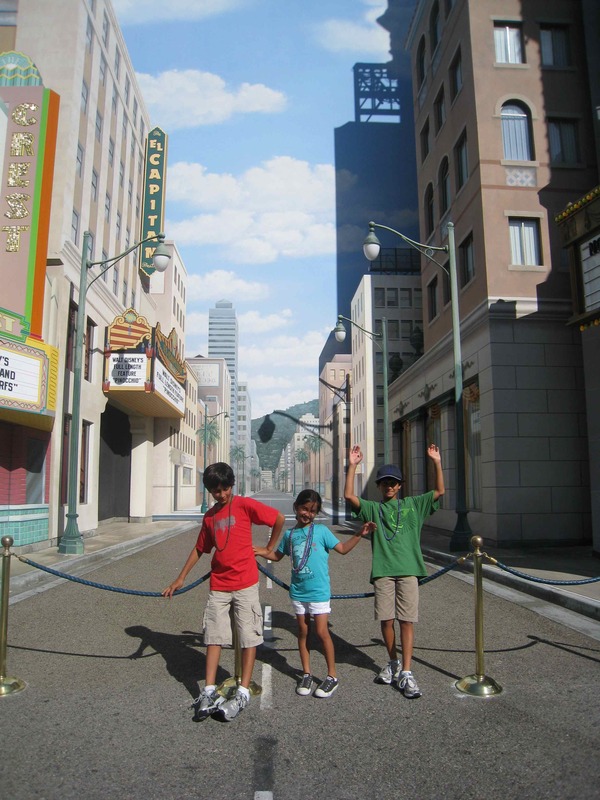 We got there when the park opened and literally walked onto most of the rides. We completed all the major roller coasters by lunch time (Space Mountain, Matterhorn, Indiana Jones, Thunder Mountain. In the afternoon, we went to California Adventure. This was our first time there. The rides were much more exciting. 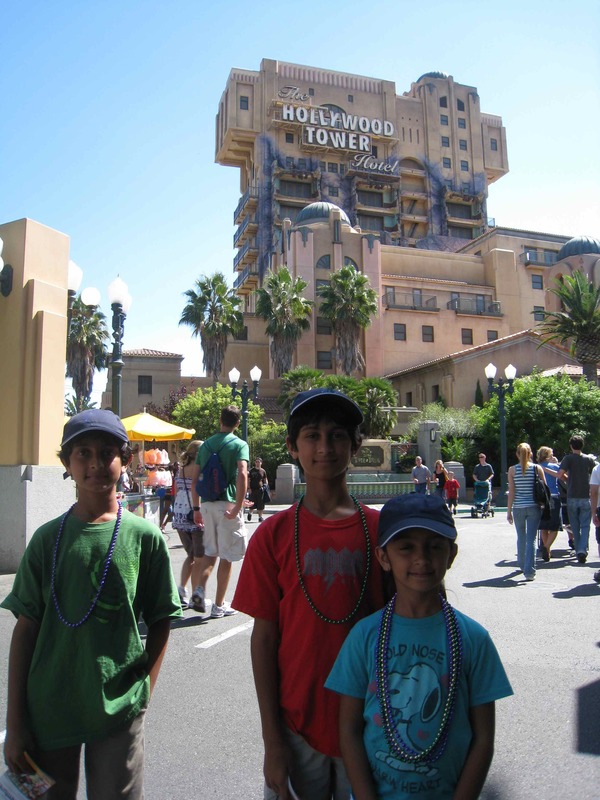 Here are the kids at the Hollywood Hotel ride. This is the same ride they have at Disney World in Orlando. Way cool! We rode it twice. 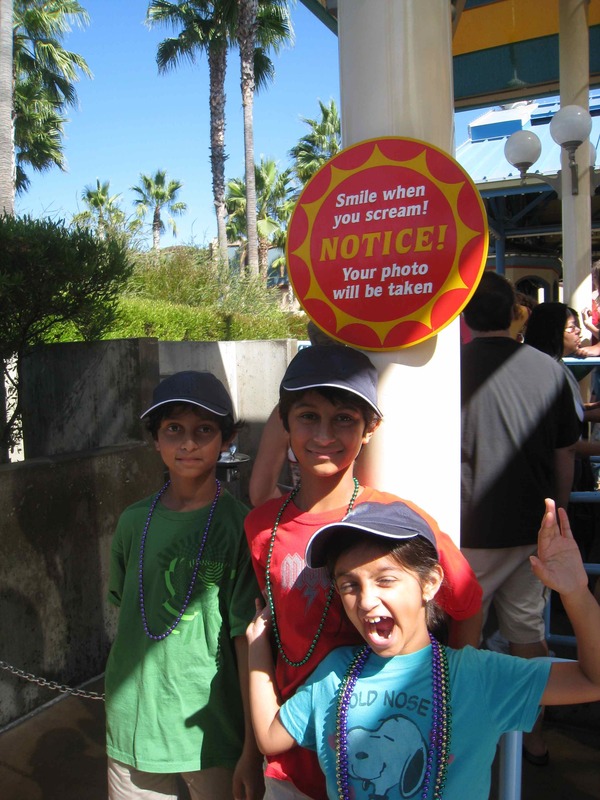 We also did the California Screamin ride twice. By about 5 o’clock, we were all pooped and hungry! 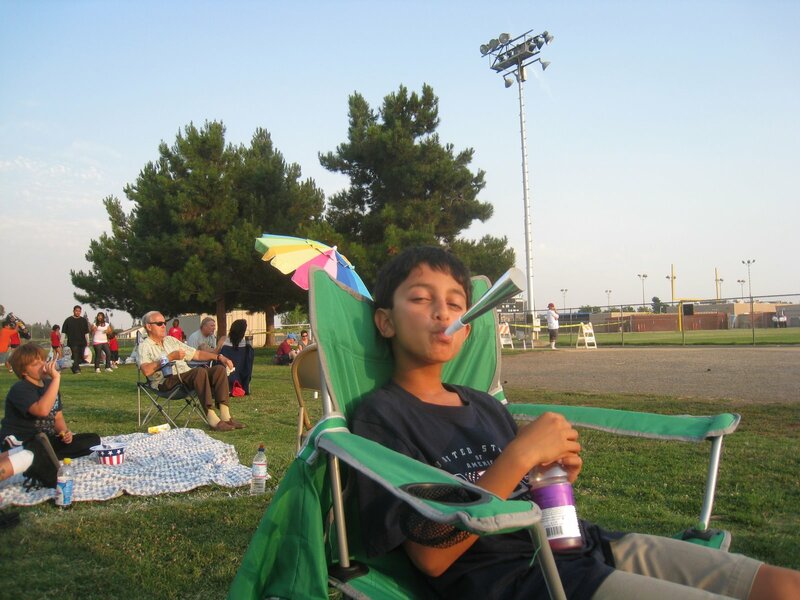 Nikhil had a race out in Corona early the next morning so we decided to head back home and get some rest. One last pose in front of the faux skyline. Note the realistic clouds and shadows. Our 5 year old Dell computer died last week and took along all of the pictures on my hard drive. I am planning on sending it in to a data recovery service that will charge $600 to try to see if they can recover any of the pictures. Anyway, after being upset with Dell, I went to the Apple store and picked up a new 24″ iMac to see what all the fuss was about. The hardest part was figuring out where the on/off switch was on the Macs! 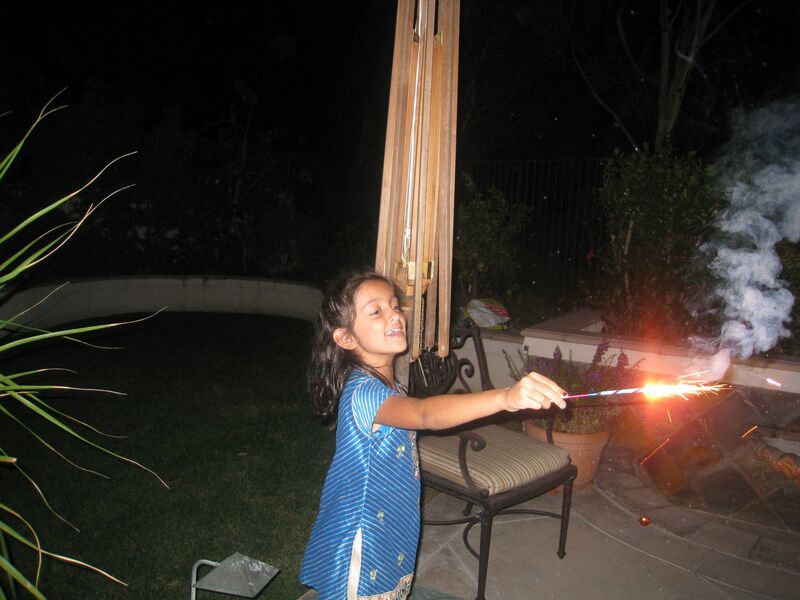 I was able to very easily upload new pictures from our camera – just plug it in. No Canon or other software to install. The uploads even seem faster. 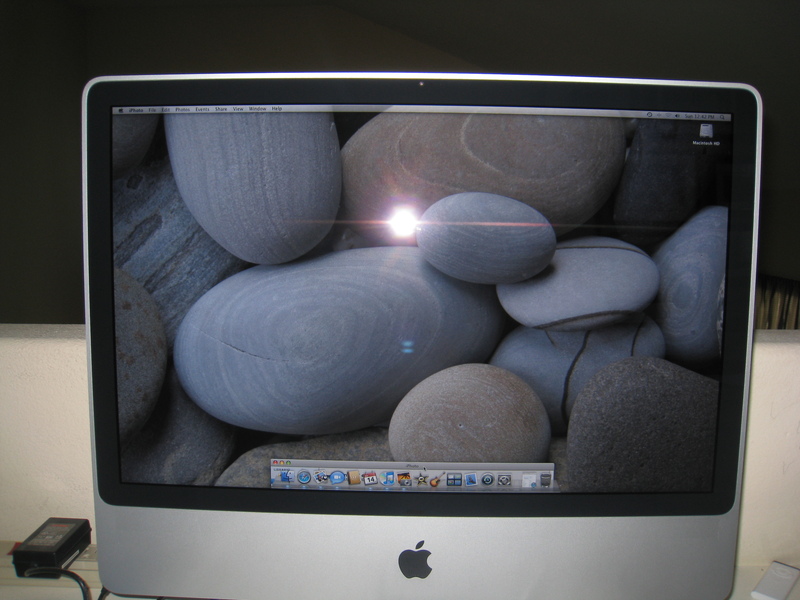 Picasa, my old editing tool on the PC doesn’t work on the Mac, so I am now learning to use iPhoto. I haven’t quite figured out how to save the image in a lower resolution so the file uploads to WordPress are quicker, but the cutover was pretty painless. And look, no more wires cluttering up my desktop. I have a basketful of cables going in the trash! 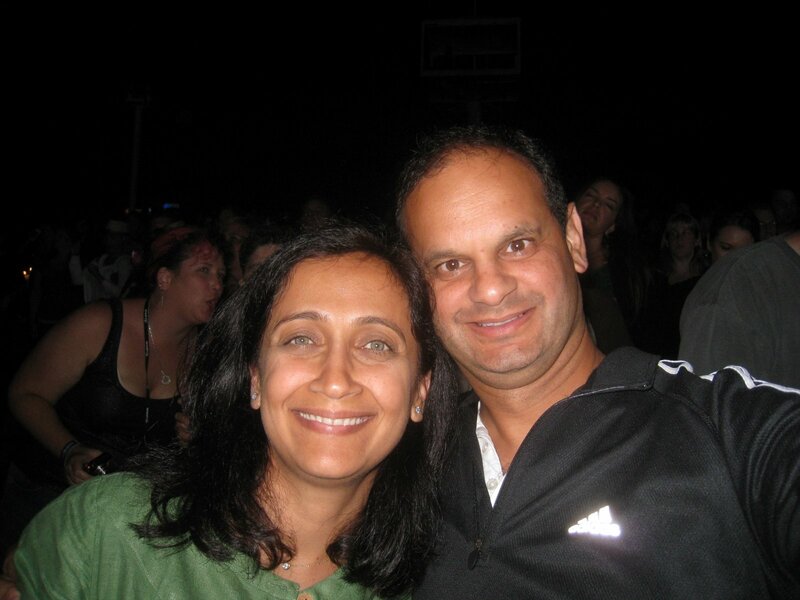 On Thursday night, Anjali and I went to a concert at the Pacific Amphitheater. The opening band was the Psychedelic Furs. I remember listening to this group back in the early 80’s. Their claim top fame was “Pretty in Pink” which they saved until the very end. A couple of other songs they played that made the charts included “Ghost in You” and “Love My Way”. Their performance was mediocre at best. The lead singer must be in his late 50’s now and his voice was not quite what it used to be! He also doesn’t get around quite the way Mick Jagger does! Lucky for us, it was sunny, warm and quite relaxing as we watched some of the characters dancing all around us! The headliner was a group called Yaz (or Yazoo at one point). 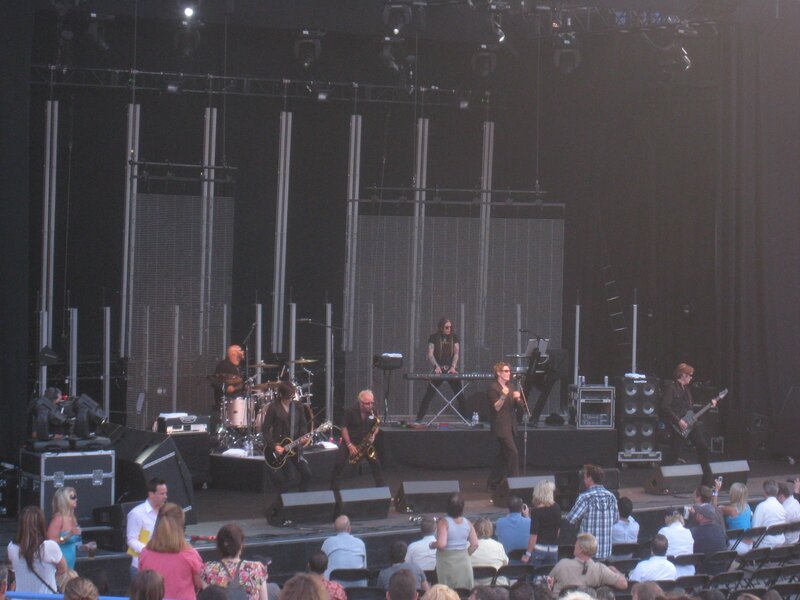 Their lead singer is Allison Moyet and she is supported by her synthesizer player Vince Clarke (formerly of Depeche Mode and afterward at Erasure). Here are Anjali and I enjoying the concert. 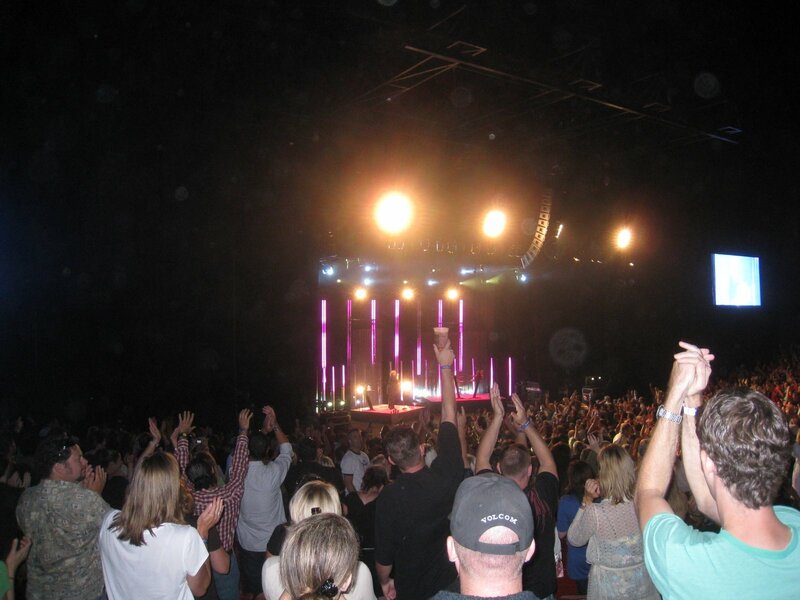 By the time Yaz started, the concert had filled up. This was their final stop of the tour, and probably the final stop of her career. Allison Moyet still sounded awesome. Unfortunately, she has ballooned up over the 200 pound mark and doesn’t look like her former self! At one point she remarked that her rubber soled shoes don’t let her move around the carpet as well as she would like. Anyway… enough commentary. Her singing redeemed the night as she banged her way thru all of her classic hits. These included “Nobody’s Diary”, “Good Times”, “Sweet Thing” and “Don’t Go” . She came back for a two song encore which included “Only You”. Here is a clip from “Don’t Go”. By the way, his entire synthesizer mix was on his Apple laptop! We had a great time at the concert. 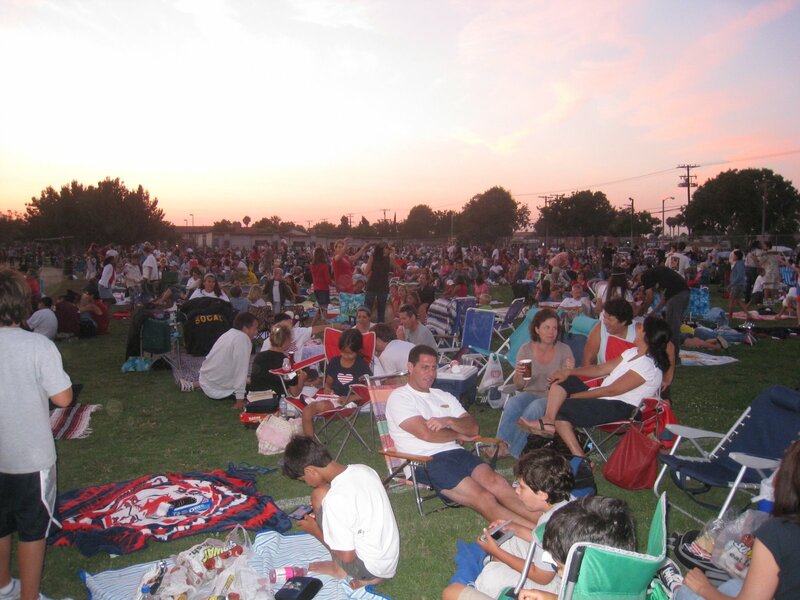 For the 4th of July festivities, we went to Tustin High School. In order to get parking and field level seating, we got there around 6:30. We had Subway sandwiches for dinner along with crackers, hummus and white peach sangria. Thanks to Bobby Flay for the sangria recipe! About an hour before the fireworks started, the field filled up. 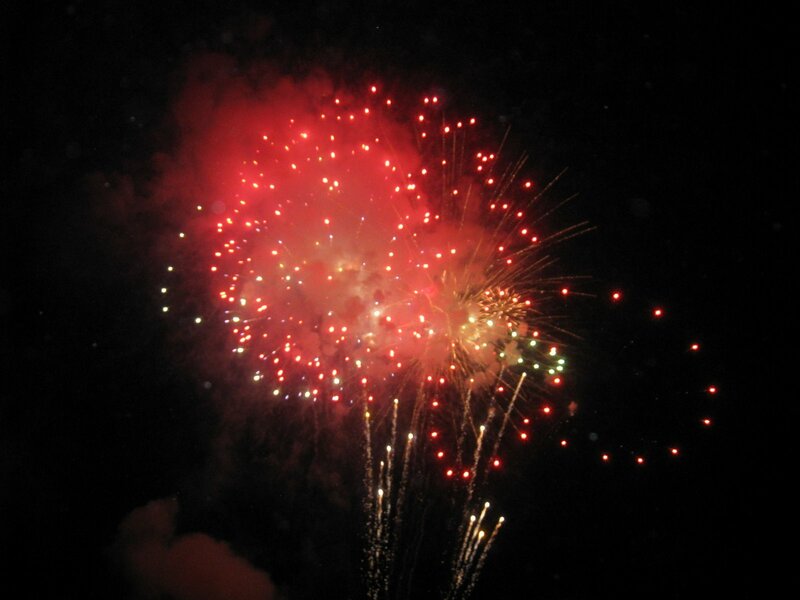 I took about 20 shots of the fireworks and only one came out pretty good! 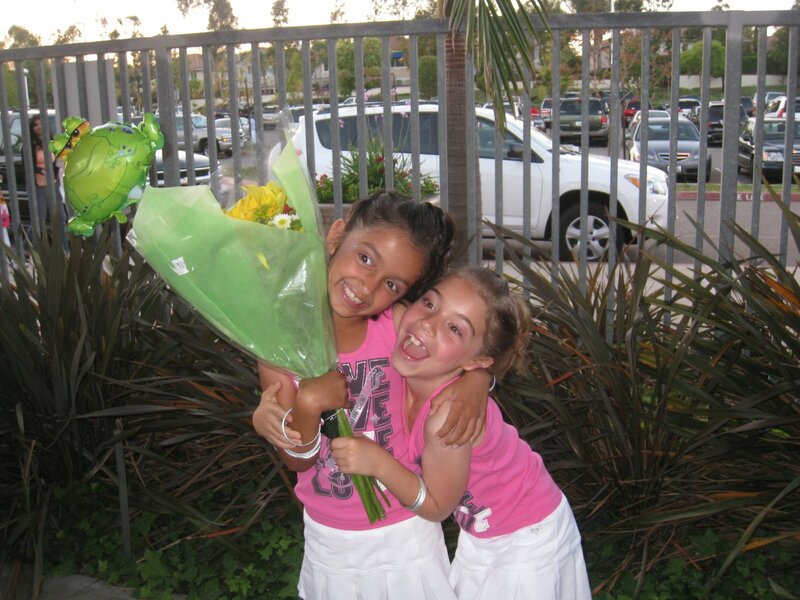 Last week Annika and her friends performed in the school talent show. Here they are after getting their makeup and costumes done. Here’s their performance. It is a song by Smash Mouth called All Star. And here are the glamour girls after their fine performance. Terry and Kriss came down from Seattle this weekend and hosted a fun evening at the Wine Cellar in Irvine. 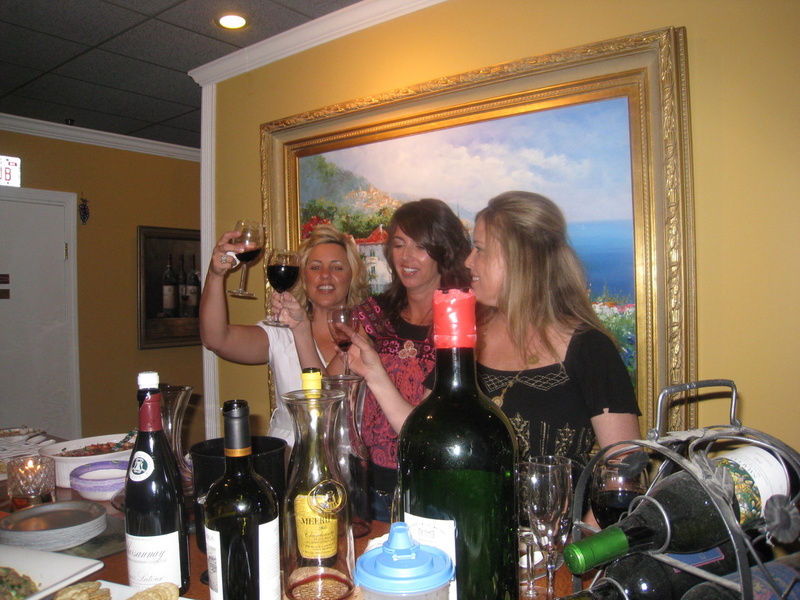 It is actually a wine storage building that we used for our private party. The Bordeaux was flowing from about 5pm until closing. Following are a couple of pictures from the evening. Here are the 3 birthday girls: Joy, Kriss and Kim. 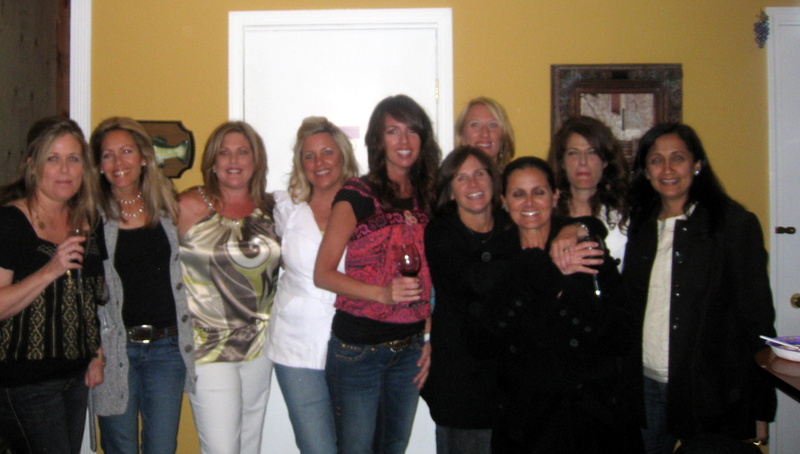 And here are the Real Housewives! It was a very fun evening albeit a bit chilly in the 57 degree temperature controlled wine locker but a wonderful relief from the 90 plus degree temperatures in SoCal this weekend.